Looking for a unique color palette for your wedding? Try Camouflage! Whether your an army brat, obsessed with the outdoors or just looking to make a statement, this color palette may be for you. 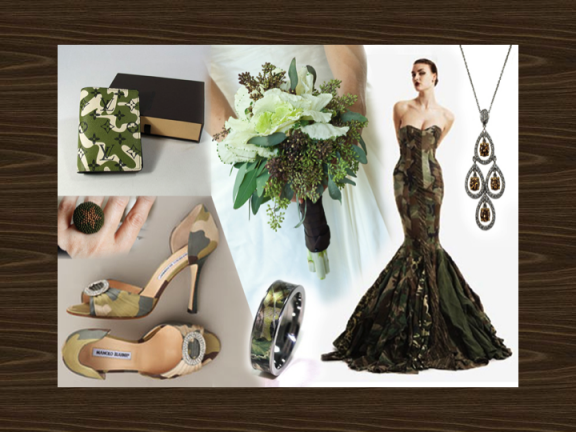 If the full Camo theme isn’t quite your thing, then maybe just a few statement pieces will do the trick (check out those heels)! Or, if organic is your thing, choose shades of brown and green, like this beautiful, textured bouquet made of white kale and seeded eucalyptus. Check out the full post on OneWed’s Bridal Blog, Savvy Scoop. Then head to FiftyFlowers to find your color palette! Father (& Groom) Favorites – 10 Percent OFF! Summer Brights – 10 Percent OFF!